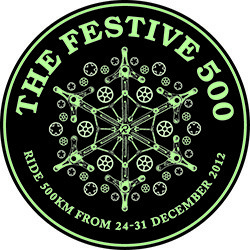 Strava's Christmas challenge for 2012 is the Festive 500, and you simply have to ride 500km between Christmas Eve and New Year's Eve (inclusive). That's almost 311 miles in eight days, or around 40 miles per day. Not a lot, you might be thinking, especially if you have time off over the period. However, Christmas is notoriously a time for festivities, watching TV repeats with family and eating... eating LOTS. So, how do we fit in all of that cycling? Tuesday 25th 20 miles: Quick local sprint, before present opening! That lot adds up to 320 miles, so I haven't got any room for error! Monday's early morning ride was cut short because of loud scraping noises coming from the bottom bracket - undoubtedly a bearing failure. By the time I limped home the chainring was wobbling merrily! To make up the distance, I put in a quick 10 miles on the Essex coast (after driving down to my Mum's). Didn't quite meet my target. Tuesday's early morning ride didn't happen, so I instead put in a longer evening ride after driving back home from Essex. The ground was wet, but the brisk westerly wind was mild. I managed to easily exceed my target. On Wednesday, time restriction and a strong west headwind mean that I didn't quite reach Wells; Holt was as good as it got. It was a sunny ride though, so high spirits allowed me to squeeze in 50 miles - slightly below target. Thursday's ride to south Norfolk went to plan, along with a trip to Halfords to pick up a new bottom bracket for my usual road bike. Rain started towards the destination, so I got rather wet and mucky in the country lanes - and got wet and chilled on the ride home. I took the shortest route, so missed my day's target by 10 miles. Despite foul looking skies I forced myself down to Norwich on Friday, in an unpleasant headwind and drizzle. Didn't take the long route, so only managed 35 miles. By Saturday miles were running a little short, so I upped the distance to 39 miles - and also headed south along the Norfolk coast, because of a rather fierce south-westerly wind. I added a few more miles later on by giving the cross bike a quick test run. I did more warming up than usual at Sunday's cyclocross event, and bright sunshine meant that I could stay warm despite the slow speed. I achieved the target of 20 miles. The final big push on Monday - 40 miles remaining - had to be done early before some bad weather moved in. I managed to meet up at 7AM with a fellow Strava rider, and we worked well together against the strong southerly wind. 44 miles ridden, job done!